MOSCOW – Many commentators in American media see Russian President Vladimir Putin as an authoritarian leader who rigs elections at home and abroad, silences political adversaries, rescinds civil rights and tirelessly plots to revive a Soviet-sized empire. While some of his own citizens share such criticisms, others celebrate Putin as an Eastern Orthodox czar, warring with the forces of the Antichrist in an apocalyptic struggle for the soul of Christian civilization. Putin is “our ‘katechon,’” said Dugin, referring to “the figure mentioned by St. Paul in his writings concerning the end of time.” The word literally means “the ‘supporter’ who prevents the coming of the Antichrist,” a role that some Orthodox theologians attributed to the Byzantine emperors. According to Dugin, the Antichrist is found today in the secularizing forces at work in Western countries, particularly in the United States. In contrast, Dugin highlights Putin’s efforts to discourage the practice of homosexuality, protect Christians in the Middle East and promote the Orthodox Church in Russian society as evidence of his Christian leadership. “President Putin is certainly the figure that advances this Orthodox, Christian, Russian agenda, and he defends our identity,” Dugin told Catholic News Service. Once a high-profile academic, Dugin was head of the Department of Sociology of International Relations at Moscow State University in 2014. At that time, he was accused of supporting violence in Ukraine. Then, in 2015, Dugin was added to the U.S. Department of Treasury’s “Specifically Designated Nationals and Blocked Persons List” for his support of pro-Russian separatists in Ukraine. Significantly, the report also said as many as 41 percent of Russians believe that, in some circumstances, nondemocratic forms of government are preferable to democracy. But at the same time, many Russians are growing increasingly suspicious of Putin’s overtures toward the Orthodox Church. “People think that our officials’ Christianity is nothing more than public relations,” said writer Maya Kucherskaya, pointing out that government officers are often seen on televised church services. “They even have a name for such an official: ‘a candlestick,’” Kucherskaya said. Kucherskaya’s 2011 book, “Faith and Humor,” detailed the rebirth of Russian Orthodoxy in the 1990s after the fall of communism. But as parish attendance plateaued and church officials began collaborating with the government, she said her optimism waned. Deacon Andrey Kuraev, a popular blogger and critic of church-state ties, said he was skeptical of some of the government’s measures to promote Orthodoxy in modern Russia. He noted that that the Russian government under Putin has restricted religious freedom for some non-Orthodox groups, such as the Jehovah’s Witnesses. 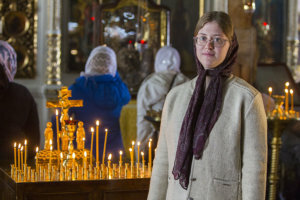 For Maria Gnevsheva, 19, a student of Danish and Scandinavian literature at Moscow State University, politics should be kept out of religion altogether. For other Russians, however, the mixing of politics and religion belongs to the Orthodox tradition of “symphonia,” which holds that state and church have a duty to cooperate to realize Christian ideals in society. Putin is the only Russian leader “in 100 years who understands this role of the state,” said Konstantin Malofeev, a financier and founder of Tsargrad TV, a Russian Orthodox television channel.